The Public Notice Research and Education Fund has recently made news with a new venture called Spendopedia. It's intended to be exactly what it sounds like: a permanent, ever-growing, searchable, free online encyclopedia of questionable US government expenditures. Modern government is a Neptunian phenomenon: it relies on secrecy, propaganda, and deception in order to maintain and expand itself. For the state-parasite to survive, it must fool its host into believing that it is wise and efficient. Spendopedia promises to expose the lie and become another great assault on the dangerous idiocy of statism by the internet. If successful, it may join the ranks of Wikileaks, Bitcoin, alternative news media such as Infowars and the Drudge Report, and the recent internet-fueled presidential campaigns by Ron Paul. Sun conjunct Mercury in Leo in the 11th: an attention-grabbing smartass talking social issues. Jupiter (Cancer) - Uranus (Aries) - Pluto (Capricorn) T-square: The populace (Jupiter in Cancer) battling the powers that be (Pluto in Capricorn) through technology (Uranus). 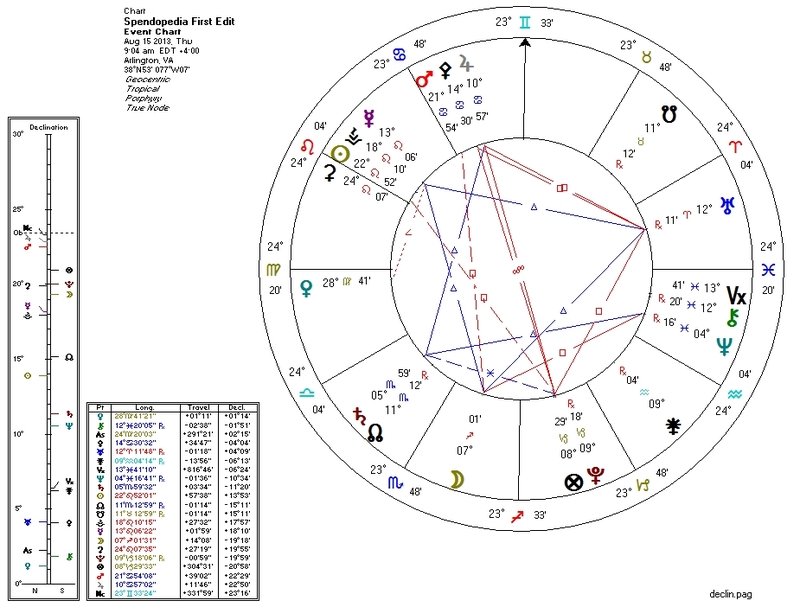 Mercury (11) - Uranus (7) - Moon (3) grand trine: mass public communication. Jupiter conjunct Pallas in the 10th: proficiency in mass-communications. Nodes square Mercury: a lot of emphasis on communication. Uranus square and contraparallel Pallas: effective use of humor. Venus in Virgo rising: a focus on the practicalities of money. Venus semisquare Mercury: Venus/Mercury connections are common in the charts of economists. North Node in the 2nd: fiscal conservatism. Saturn in the 2nd: struggle/work regarding resources and money. Chiron in the 6th: repair/healing of damaged processes. Pallas opposite Pluto but trine North Node: typical in "whistleblower" types. We could go on, but the picture seems clear. Here's hoping Spendopedia has a long and fruitful future.